Blackheads are the worst! Not only are they unsightly and annoying, but they are STUBBORN! Lately I have taken a special interest in skin care products and trying to do something about the terrible blackheads on my nose and chin. I have tried a lot of different things, but here are my favorite products that are minimizing the appearance of blackheads on my face. This is my favorite face wash for treating blackheads. It is a gentle scrub and never irritates my skin. 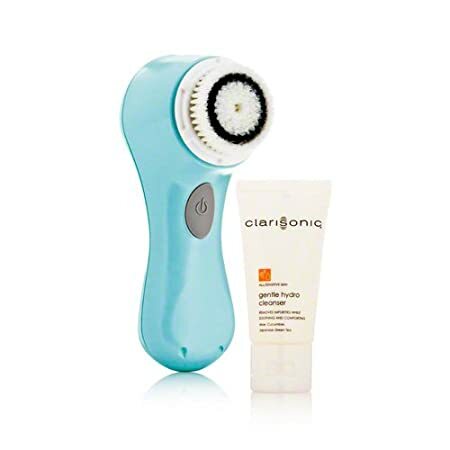 I can’t say enough good things about my Clarisonic Mia. I originally bought it because I had read about it because it can decrease the appearance of fine lines and aging. Which it has actually helped with! But, it has also been awesome with treating my blackheads and helping me to really exfoliate and deep clean. It is definitely a bit of a splurge, around $100 on Amazon.com , but for me it has been worth it and if it died tomorrow I would buy a new one. I LOVE this product. I tried a sample of Glam Glow and just wasn’t impressed. I was a little skeptical when I was at Sephora and they recommended I try this product instead. I tried it and I LOVE it! You can feel it tingling on your skin. When I rinsed it off, my pores looked visibly smaller. Stick to it and do it once or twice a week and you will start to see your blackheads disappear! Those are my 3 favorite products for treating my blackheads. What are yours? The same products? Something different? Let me know, I want to hear from you! This entry was posted in Beauty, Skin Care on May 8, 2013 by Heather. The first product is the best of the three.. I do recommend for you to post Amazon links in your pictures to relevent blackheads products. DO NOT BUY FROM AMAZON!!! They are not an authorized retailer and are ineligible for replacement or repair if they stop working.